"Wow, every busy woman needs to read this book! I sure did! Crystal very clearly identifies the habits leading to that “barely surviving” feeling so many of us have&emdash;which eventually leads to burnout. And she offers very practical and insightful solutions. I have long admired Crystal’s ability to create and stick to good boundaries and habits&emdash;which is a big reason for her success! And I’m so grateful she’s sharing her secrets so we can have them too!" "I love, love, love this book. Crystal challenges me at each priority to be intentional, purposeful and to plan my life strategically so that I can cultivate a more centered life. So many practical suggestions, great stories relevant to my life and inspiration to live life well. I hope all of my friends will buy a copy of this book!" "Say Goodbye to Survival Mode is a cover to cover read! Jo is the down to earth, genuine mom you need to learn from – have your highlighter ready! This book is packed with experiential wisdom, practical helps and “you can do this” encouragement that will give you hope and catapult you into action!" "We’ve exhausted ourselves by overcommitting and trying to maintain such crazy schedules that we can’t even find a time slot to take a breath from it all. This book will give you that breathe of air. 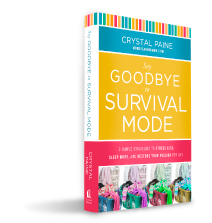 For the woman who does it ALL, take a few minutes to read Jo’s new book, Say Goodbye to Survival Mode. You won’t regret it!" Author, Speaker, and Innovator at Twitter, Inc.
"Imagine stopping the frantic pace of our hurried lives to regain peace and purpose. Crystal's book, full of practical insights and helpful advice, will help us do just that. This invaluable resource is like having a personal time and money manager at your fingertips." "The scheduling monster can easily take every spare minute you have available, and is something I battle regularly. Crystal walks us through how to tame the beast and prioritize what’s important, leaving us with time to both recharge and pursue our passions. I’m thankful for her wisdom and practical advice to choose joy and contentment, and her encouragement to start small…but to start somewhere!" "You would think that someone who has accomplished as much as Crystal would be writing the 'I’ve been a success, and if you do what I say, you can too!' kind of book that every leader seems to be writing these days. But instead, she writes a book that speaks the truth with love to women who having to manage more than ever before&emdash;and she’s giving all us girls a well-deserved break. In her warm been-there-done-that tone, Crystal guides you past mere survival and give you practical steps you need to live the kind of life you were designed to live, with renewed encouragement and a whole lotta hope." "Jo candidly shares her journey of how she learned to live a life of purpose and intention in Say Goodbye to Survival Mode. This book is a perfect blend of how-to no-nonsense advice and friendly coffee talk with a trusted friend. Thanks to Paine's nudge, I have streamlined my out-of-the-home commitments so I can be more present to my family." NYT best-selling author, blogger, and slow cooking expert. You can find her online at stephanieodea.com. "The weight of the world began rolling off my shoulders somewhere between the first and second chapter. I hadn’t fully realized how much my current workload had me in a chokehold until I began reading the pages of Jo’s beautifully written book. The advice is not earth shattering but it is life altering. It is the simplicity of what Crystal shares, and the openness by which she does it, that allows for us to Say Goodbye to Survival Mode and hello to our best life yet." 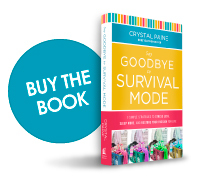 "If you’re dog tired, frazzled and feeling overwhelmed by life and its crazy demands, pick up Say Goodbye to Survival Mode by Jo. It’s a balm for a weary day and a kind kick in the pants to live the intentional life you’ve longed for. Crystal’s been there—from burnout to joyful living—and she can help you thrive in the midst of stress." ©2013 December212012® LLC. All rights reserved.